I’m told that the aperitivo is a fairly new invention in Rome, being imported from Milan and elsewhere. Aperitivo meaning the huge buffet that is often served in bars around the capital, as opposed to a pre-dinner snack-ette. In one way an overloaded plate of pizza slices, sandwiches, pastries, pasta salad, rice salad, cous-cous and roasted vegetables is a delightful way to accompany a 10euro drink. In another way, sometimes I really don’t want or need to eat cold pasta and so much dough-based product in what is essentially just supposed to starve off the hunger pangs til tea-time. Especially when accompanied by much pushing and shoving in a race to fill your plate when any new dish is brought out (without being thought a greedy pig of course). I’m tempted to say that it is purely an ex-pat misunderstanding of aperitivo, that just because food is there and “free” we don’t need to eat it all. We need to realise that it is not supposed to replace a proper meal. But our greediness seems to be catching. Hence the pushing and shoving. 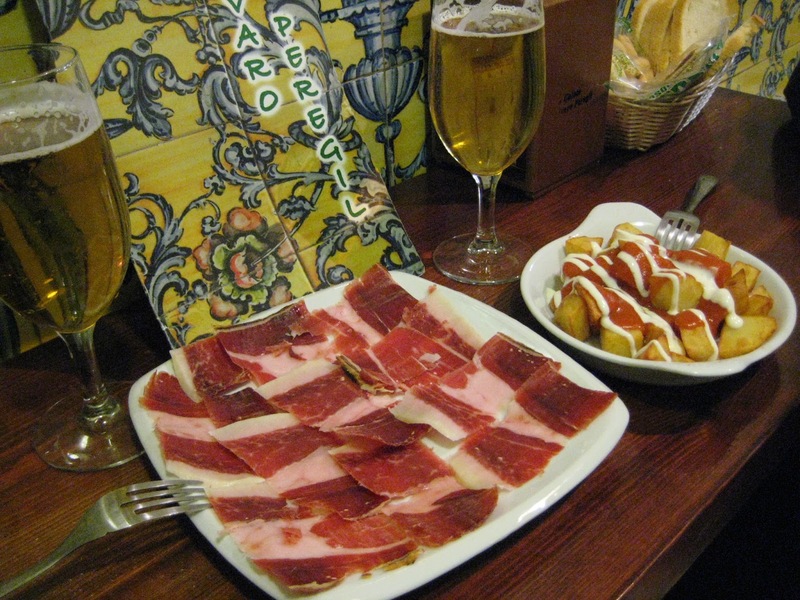 Jamon serrano and patatas bravas. Having just got back from Seville, I’m reminded that the true masters of the aperitivo are the Spanish. With beers from as little as 1euro and tapas from 2euros it is possible to flit from bar to bar just stopping for a little nibble of something delicious in each. No need to gorge on pastry to justify an expensive drink. Just plenty of potatoes, tortilla, ham, cheese and yummy spinach and chick-pea sludge. No contest. 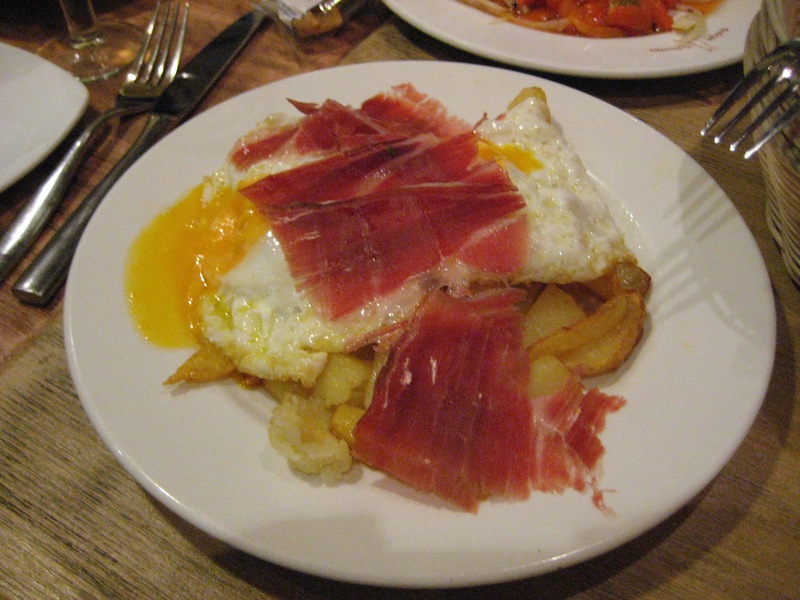 Chips and egg Spanish style. Just a question for the Yorkshire folk, what is the nibble of choice with drinks in Bradford? Does anyone remember the fish-man who brought winkles into the British Queen every week? (Absolutely no jokes there at all). Next Were you in the square? Oh, I can just picture them in the huge jars behind the bar! Filthy stuff. I like a few packets of Seabrook crisps(made in Bradord). I used to smell the fat in the air on my journey to work and thought that Mother Hubbard's had opened early! But salt and fat you can't beat it with a nice pint of Webster's Best. Seabrooks! Do they still make them? !